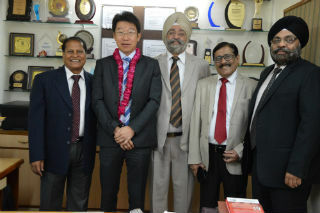 The occasion was graced by the presence of our esteemed dignitary Mr Masaru Akiyama(Director, Mitsubishi Corporation) who was the Chief Guest and Mr T.S Ahluwalia(Member-Managing Committee) as Guest of Honour for the event. 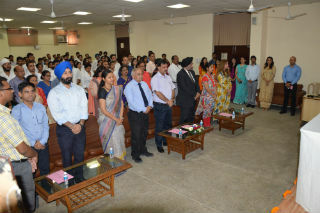 They were joined on the dais by Dr. J.K Goyal (Director – JIMS, Rohini), Dr. Ashok Bhagat (Dean – IB & Placements). 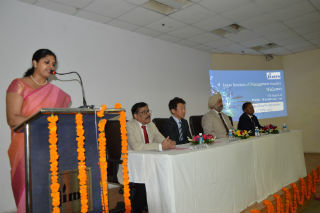 The programme started on a warm and traditional note with the lighting of the lamps and saraswati vandana. The session was kicked off by Dr Ashok Bhagat ( Dean – IB)who welcomed the students and also highlighted the vision and challenges of the rigorous journey that they were embarking on for the next two years. He also emphasized the need to cultivate the 3 Ds of life i.e Discipline, Dedication and Determination which can pave the way for their success in future. This was followed by a thought provoking and inspiring speech by Mr Masaru Akiyama(Director, Mitsubishi Corporation) who taught the students about the value of developing the right attitude and shared his 7 mantras for success. 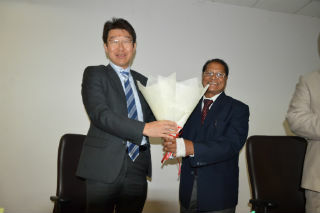 He further explained about the huge potential and opportunities in pursuing International Business in todays world scenario. 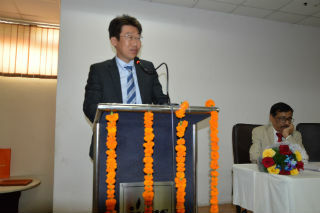 The Second session of the day was lead by Dr Ashok Bhagat (Dean-IB). He conducted an ice- breaking and introductions session with the students and also familiarized them to the various rules and regulations applicable to them in Campus. 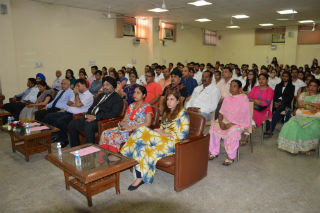 All the key associated departments including CRMC, Strategic Alliance & Corporate Affairs, HoDs , key staff & support teams were introduced during this session. The last session of the orientation programme was lead by Mr Gaurav Vashisth and his team on the topic “Your Attitude is your Altitude”. The session was conceptualized to expose students to key skills including Interpersonal Communication, Personality Development, Leadership & Team Building, Presentation Skills and Negotiating Skills;The session saw a lot of interaction and participation of the students and was very well appreciated. With this, the curtains came down on the Orientation Programme for the new IB batch, leaving them with the promise and hope of an exciting and exhilarating course which will shape their future careers in the corporate world.